In this "How To" video demonstration we are going to show how to use a brown eyeliner pencil to obtain a lovely soft daytime look. Everybody automatically reaches for a black eye pencil but we're going to use brown. It's a lot softer, so much nicer for daytime. 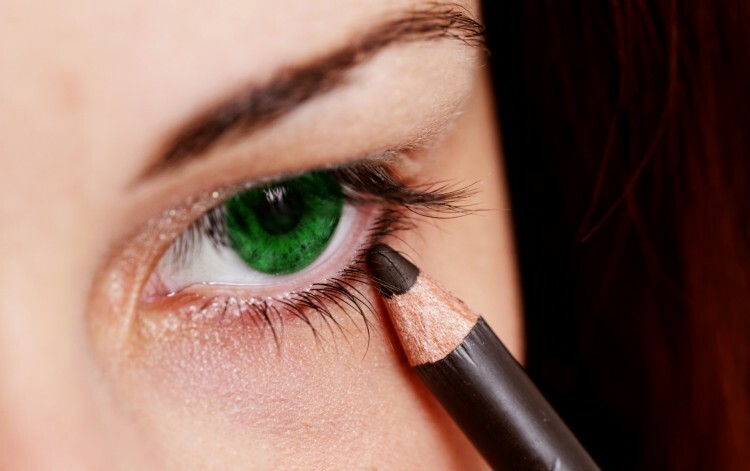 Get the pencil on the outer corner of the eye and just do a really soft line as close to the lashes as possible. You want to concentrate the colour to the outer corner of the eye so what you want your eye pencil to do for you is to make your eye stand out and open up. Just do a really soft line. What's brilliant is if you can get an eyeliner pencil with a smudger on the end. Take your smudger and gently smudge the pencil up, which is very important, up and out. Because what you don't want to do with an eye pencil is get the corner to go down, because that way you're dragging your eye down when really you want to lift your eye up. Then just softly smudge all the way along the top so you've got a really soft line. And if you don't have a smudger, you can just use your finger because this look doesn't have to be perfect. Next, we're just going to take the eye pencil and just do really light feathery strokes under the eye. What you don't want to do is get the pencil and do a hard line, which I so commonly see and it's not flattering on anyone. So go with really light feathery strokes and then again, either use your smudger or literally just use your finger. The key to this look is no hard lines; this look doesn't have to be perfect. Another mistake I see is people going far too far into the corner of their eye. That's much more evening look and it closes your eye up as well. If you've got smaller, close-set eyes, a rule of thumb is to use your pupil as a finish line; so never go further in than your pupil. If you want to quickly vamp it up, just to go out in the evening, literally just pull the eyeliner inside the eye. When you do the line inside the eye, it almost always looks better when you've done a nice soft smudge of eyeliner underneath, otherwise it can close the eye up. Finish this look with a slick of mascara. I absolutely love brown eye pencils; so much softer than black, so much prettier for the daytime. Now you know how to apply this great daytime eyeliner trick! False lashes can make a really big difference on a night out and add impact but they can be a little fiddly to apply so in a few simple steps using a video demonstration, we're going to show you how easy it can be. Copyright © 2019 Andrew Wilson - Knowhow-Now.com. Content is provided by our members and trusted partners. We do not guarantee the accuracy of any such content.